زمزمیان, کامیار. (1392). شرایط مرزی برپایه مشخصه‌ها برای تحلیل جریان تراکم ناپذیر داخل کانال در عبور از پله. نشریه پژوهشی مهندسی مکانیک ایران, 15(4), 6-22. کامیار زمزمیان. "شرایط مرزی برپایه مشخصه‌ها برای تحلیل جریان تراکم ناپذیر داخل کانال در عبور از پله". نشریه پژوهشی مهندسی مکانیک ایران, 15, 4, 1392, 6-22. زمزمیان, کامیار. (1392). 'شرایط مرزی برپایه مشخصه‌ها برای تحلیل جریان تراکم ناپذیر داخل کانال در عبور از پله', نشریه پژوهشی مهندسی مکانیک ایران, 15(4), pp. 6-22. زمزمیان, کامیار. شرایط مرزی برپایه مشخصه‌ها برای تحلیل جریان تراکم ناپذیر داخل کانال در عبور از پله. نشریه پژوهشی مهندسی مکانیک ایران, 1392; 15(4): 6-22. نحوه اعمال شرایط مرزی در روش های حل عددی به دلیل تاثیر مستقیم بر دقت جوابها و سرعت همگرایی، از اهمیت زیادی برخوردار است. در جریانهای تراکم ناپذیر لزج، به دلیل شرط عدم لغزش روی مرزهای جامد، مولفه های سرعت روی این مرزها صفر است و فشار روی مرز با استفاده از برونیابی سلول های نزدیک مرز به دست می آید. در مقاله حاضر روش جدیدی برمبنای مشخصه های معادلات برای تخمین فشار در روی مرزهای جامد ارائه شده است. به منظور ارزیابی روش جدید، جریان داخل کانال در عبور از پله در اعداد رینولدز مختلف مورد بررسی قرار گرفته است. بدین منظور یک برنامه کامپیوتری براساس روش تراکم پذیری مصنوعی و طرح محاسباتی برپایه مشخصه‌ها (CB) نوشته شده است. مقایسه روش جدید محاسبه فشار روی مرز جسم و روش قدیمی برونیابی فشار از سلول های داخل محدوده حل، نشان دهنده سرعت همگرایی بالاتری برای روش جدید می باشد. همانطورکه در ادبیات فن نیز گزارش شده است، طرح محاسباتی برپایه مشخصه‌ها (CB)، اساسا دارای روند همگرایی کندی می باشد که با اعمال روش مشخصه‌های ارائه شده برای مرزهای جامد تا حدودی سرعت همگرایی روش محاسباتی افزایش خواهد یافت. Chorin, A. J., ”A Numerical Method for Solving Incompressible Viscous Flow Problems”, Journal of Computational Physics, Vol. 2, pp. 12– 26, (1967). Farmer, J., Martinelli, L., and Jameson, A., "Fast Multigrid Method for Solving Incompressible Hydrodynamic Problems with Free Surface", AIAA Journal, Vol. 32, pp. 1175-1182, (1994). Rogers, S.E., and Kwak, D., "Steady and Unsteady Solutions of the Incompressible Navier-Stokes Equations", AIAA Jounral, Vol. 29, pp. 603-610, (1991). Liu, C., Zheng, X., and Sung, C.H., "Preconditioned Multigrid Methods for Unsteady Incompressible Flows", Journal of Computational Physics, Vol. 139, pp. 35-57, (1998). Kallinderis, Y., and Ahn, H.T., “Incompressible Navier–Stokes Method with General Hybrid Meshes”, Journal of Computational Physics, Vol. 210, pp. 75-108, (2005). Yuan, L., “Comparison of Implicit Multigrid Schemes for Three-dimensional Incompressible Flows”, Journal of Computational Physics, Vol. 177, pp. 134-155, (2002). Drikakis, D., Govatsos, P.A., and Papantonis, D.E., "A Characteristic Based Method for Incompressible Flows", International Journal for Numerical Methods in Fluids, Vol. 19, pp. 667-685, (1994). Drikakis, D., "A Parallel Multiblock Characteristic Based Method for Three-dimensional Incompressible Flows", Advances in Enginering Software, Vol. 26, pp.111-119, (1996). Drikakis, D., Iliev, O.P., and Vassileva, D.P., "A Nonlinear Multigrid Method for the Three-dimensional Incompressible Navier–Stokes Equations", Journal of Computational Physics, Vol. 146, pp. 301-321, (1998). Zhao, Y., and Zhang, B., “A High-order Characteristics Upwind FV Method for Incompressible Flow and Heat Transfer Simulation on Unstructured Grids”, Computer Methods in Applied Mechanics and Engineering, Vol. 190, pp. 733-756, (2000). Tai, C. H., and Zhao, Y., “Parallel Unsteady Incompressible Viscous Flow Computations using an Unstructured Multigrid Method”, Journal of Computational Physics, Vol. 192, pp. 277-311, (2003). Tai, C. H., Zhao, Y., and Liew, K.M., “Parallel Computation of Unsteady Three-dimensional Incompressible Viscous Flow using an Unstructured Multigrid Method”, Computers and Structures, Vol. 82, pp. 2425-2436, (2004). Tai, C.H., Zhao, Y., and Liew, K.M., “Parallel-multigrid Computation of Unsteady Incompressible Viscous Flows using a Matrix-free Implicit Method and High-resolution Characteristics-based Scheme”, Computer Methods in Applied Mechanics and Engineering, Vol. 194, pp. 3949-3983, (2005). Tai, C.H., Zhao, Y., and Liew, K.M., “Parallel Computation of Unsteady Incompressible Viscous Flows Around Moving Rigid Bodies using an Immersed Object Method with Overlapping Grids”, Journal of Computational Physics, Vol. 207, pp. 151-172, (2005). Neofytou, P., and Drikakis, D., "Non-Newtonian Flow Instability in a Channel with a Sudden Expansion", Journal of Non-Newtonian Fluid Mechanics, Vol. 111, pp. 127-150, (2003). Neofytou, P., Drikakis, D., and Leschziner, M.A., "Study of Newtonian and Non Newtonian Fuid Flow in a Channel with a Moving Indentation", in: Sajjadi, Nash, Rampling (Eds. ), Proceedings of the IMA Conference on Cardiovascular Flow Modelling with Application to Clinical Medicine, Salford, UK, 1998, Clarendon Press, Oxford, (1999). Neofytou, P., “Revision of the Characteristics-based Scheme for Incompressible Flows”, Journal of Computational Physics, Vol. 222, pp. 475-484, (2007). 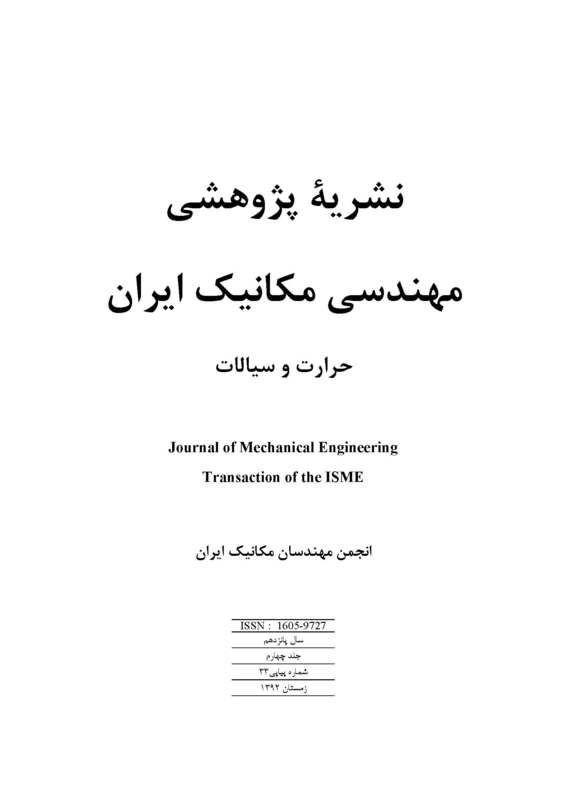 Mazaheri, K., “Numerical Wave Propagation and Steady-state Solutions”, Ph.D. Thesis, Department of Aerospace Engineering and Scientific Computing, University of Michigan (Ann Arbor), (1992). Denham, M.K., and Patrik, M.A., “Laminar Flow Over a Downstream-facing Step in a Two-dimensional Flow Channel”, Transactions of the Institution of Chemical Engineers, Vol. 52, pp. 361-367, (1974). Nithiarasu, P., “An Efficient Artificial Compressibility (AC) Scheme Based on the Characteristic Based Split (CBS) Method for Incompressible Flows”, International Journal for Numerical Methods in Engineering, Vol. 56, pp. 1815-1845, (2003). Nithiarasu, P., Mathur, J.S., Weatherill, N.P., and Morgan, K., "Three-dimensional Incompressible Flow Calculations using the Characteristic Based Split (CBS) Scheme", International Journal for Numerical Methods in Fluids, Vol. 44, pp. 1207-1229, (2004). Shapiro, E., and Drikakis, D., “Non-conservative and Conservative Formulations of Characteristics-based Numerical Reconstructions for Incompressible Flows”, International Journal for Numerical Methods in Engineering, Vol. 66, pp. 1466-1482, (2006). Gartling, D.K., "A Test Problem for Outflow Boundary Condition-flow Over a Backward Facing Step", International Journal for Numerical Methods in Fluids, Vol. 11, 953-967, (1990). Hashemi, M.Y., and Zamzamian, K., "A Multidimensional Characteristic-based Method for Making Incompressible Flow Calculations on Unstructured Grids", Journal of Computational and Applied Mathematics, Vol. 259, pp. 752-759, (2014). Zamzamian, K., and Razavi, S.E., "Multidimensional Upwinding for Incompressible Flows Based on Characteristics", Journal of Computational Physics, Vol. 227, pp. 8699-8713, (2008). Razavi, S.E., Zamzamian, K., and Farzadi, A., "Genuinely Multidimensional Characteristic-based Scheme for Incompressible Flows", International Journal for Numerical Methods in Fluids, Vol. 57, pp. 929-949, (2008).